Bus advertising is an important additional revenue stream for the company. 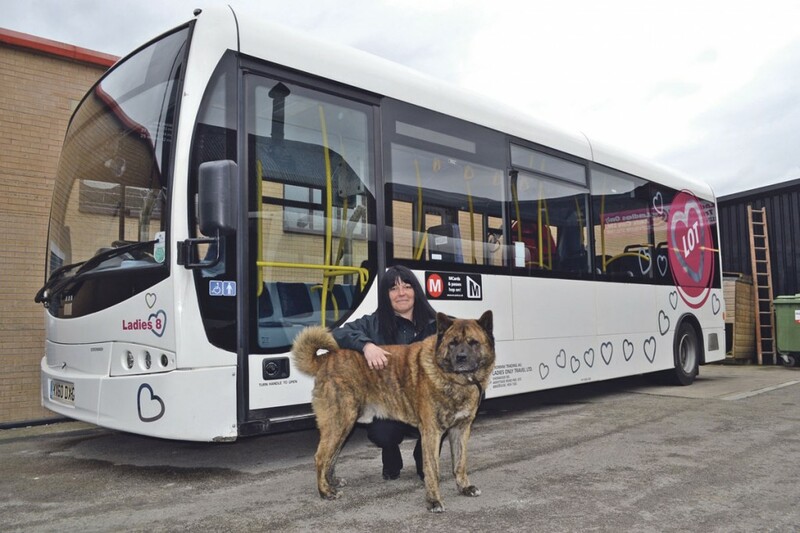 From sleeping in a minibus to a fleet of buses, Jeanette Romani’s determination knows no bounds. Kirsty Flatt met this inspirational woman. 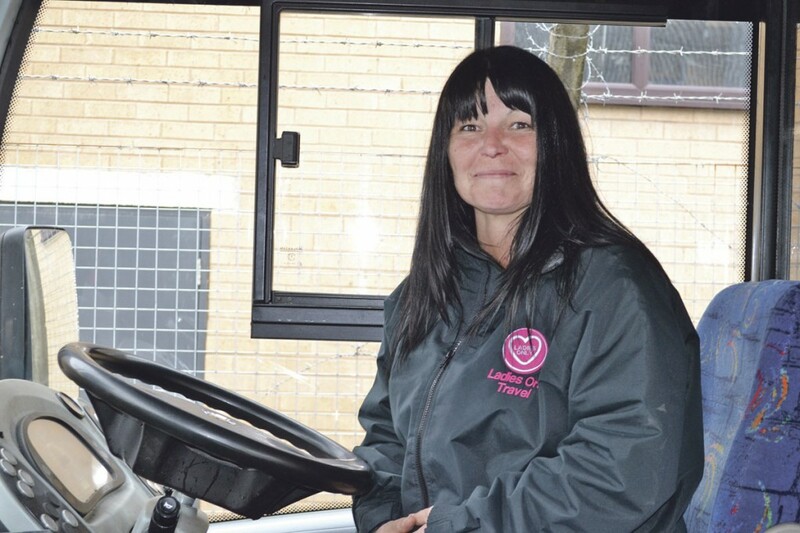 Jeanette’s story of how she started off her successful local bus operation in West Yorkshire, which until recently, was known as Ladies Only Travel is a harrowing one. On a night out in 2005, she was drugged and raped in a pre-meditated attack. Her drink had been spiked and she was taken from the club, where she was enjoying an evening with friends, to a pre-booked hotel by taxi where she was sexually assaulted and then returned to the club by her assailant. After two years of essentially being a hermit, too afraid to go out, she was overwhelmed by a desire to do something for the women of Bradford and the surrounding area, to make sure that they arrived to and from their venue safely. Her idea was to provide a door-to-door private hire service for women only. Arriving at her premises in Brighouse, I wasn’t sure what to expect. The site is shrouded by locked black iron gates and one of the biggest dogs I’ve ever seen was prowling the perimeter. However, as the age old adage goes, ‘never judge a book by its cover’. This couldn’t be more the case. 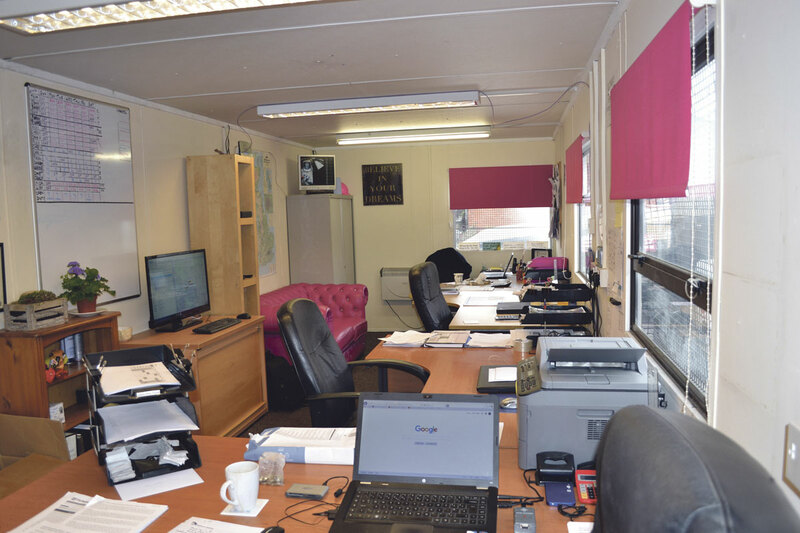 I was greeted by a short, attractive woman with one of the broadest smiles you’re likely to see and led up to the offices, which housed a bright pink sofa and blinds and an inspirational quote saying ‘Believe in your dreams’. The dog and I checked each other out and decided we could be buddies. I immediately felt relaxed in their company and Jeanette continued her story. She acquired and still holds an International Operator’s Licence and began trading as Ladies Only Travel. She was essentially homeless and all she had was her vehicle, a laptop and a mobile phone from which to run the business. The support she received from females in the area however was almost immediate and she started offering hen night services. This often meant driving to Blackpool, sometimes doing up to three trips a day and she spent many nights sleeping in the cold minibus as she didn’t want to waste precious fuel on heating, waiting to pick up passengers. Acquiring a loan was a continuing problem but she finally got help ‘from the Provident’ and she still proudly owns the repayment book. Within a year she had installed a landline at her Mum’s home, added a six seater Chrysler Voyager to the fleet, appointed Natalie Baldwin, a female friend as an additional driver and set up Ladies Only Private Hire. The vision for this was to provide a taxi service exclusively for females, driven by women. She met with objections from established firms in the area; they didn’t like her signwriting, the fact that she was female and that she didn’t charge for additional drop offs, but as Jeanette explained, ‘that just made me even more determined to succeed.’ She admits that the job was tough, saying that groups of drunken women could often be a nightmare, with them falling out and even fights ensuing. In 2007, she started doing work for Prince Henry’s Grammar School in Otley, acquiring a Renault Master for taking the students on sporting activities and as a result, set up Kid’s Only Travel as a separate entity. Last year, Jeanette made the executive decision to close the other businesses and concentrate on the service work that she does for Metro, The West Yorkshire Combined Authority. She started contract work by default in 2011 when the H10 school contract passed to her from another operator. Not knowing anything about this side of the business and whether legally she was allowed to do it, she went to Metro and asked for their advice, as she had no idea how she got paid and how it all worked. She met with Steve Wainwright and he explained how the contract would run. The relationship was forged and LOT Transport, as the company are now re-branded, operate eleven contracts for the authority, covering West Yorkshire, including Wakefield, Leeds, Halifax and Bradford. At the time of my visit there were new contracts out to tender and LOT Transport had recently been awarded another two, the 781 Leeds to Otley service and a shopper route in Bramley. 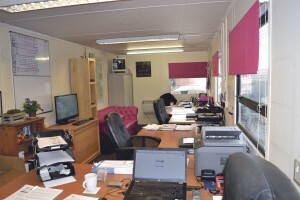 For Jeanette, although they are in business to make money, their ethos is to put the customer first. On new routes that they have taken over where someone has a ticket from another operator, they charge a minimal 50p fare, this also applies to the elderly to encourage them to use the service before 09.30 to be able to get to the doctors. She believes that because she is female, she was constantly being ripped off by garages when it came to maintaining her vehicles. Although initially naive, she soon sought a second opinion that confirmed her fears. As a direct result of this, she set up Ladies Only Autocare Ltd within the grounds of her former yard, and employed a female mechanic and apprentice to not only service their own vehicles, but to undertake work for paying customers. This was closed down with the other businesses, to concentrate on the buses and she lost a lot of money that she had invested in it. Undeterred, she has equipped this site with a workshop, complete with a pit installed by a local company and has currently invested in a brake tester from Kismet as well as some vehicle lifts. This part of the business is managed by Nigel Lake who joined them last year and Jeanette describes him as ‘brilliant! He really knows his stuff.’ She would like to take on another apprentice but questions the work ethic of a lot of youngsters these days. Despite being the boss, Jeanette is very approachable and clearly well liked. She operates an open door policy and during my visit, drivers were constantly ‘popping upstairs for a natter.’ They have their own staff room, which is less pink than the main office (although some rose hues have been sneaked in, and the uniform includes bright pink hi-vis vests) and they are provided with free tea, coffee and biscuits. This is also where staff training takes place as the room can comfortably hold ten. She doesn’t believe in titles as such and everybody is treated and paid the same; she explained, ‘It’s a team effort, we all muck in together’, so much so that she still opens up every morning and she is responsible for the hand washing of the buses. It’s her Sunday morning ritual that she finds therapeutic. She admits to being a little OCD when it comes to cleaning the vehicles and enjoying listening to Radio Two’s Sunday Love Songs whilst scrubbing away! LOT are also part of the Bradford Student Safe Spot scheme, an initiative where businesses can offer a safe place for students feeling threatened. Jeanette has implemented this on all of their services allowing safe passage and shelter on the bus. 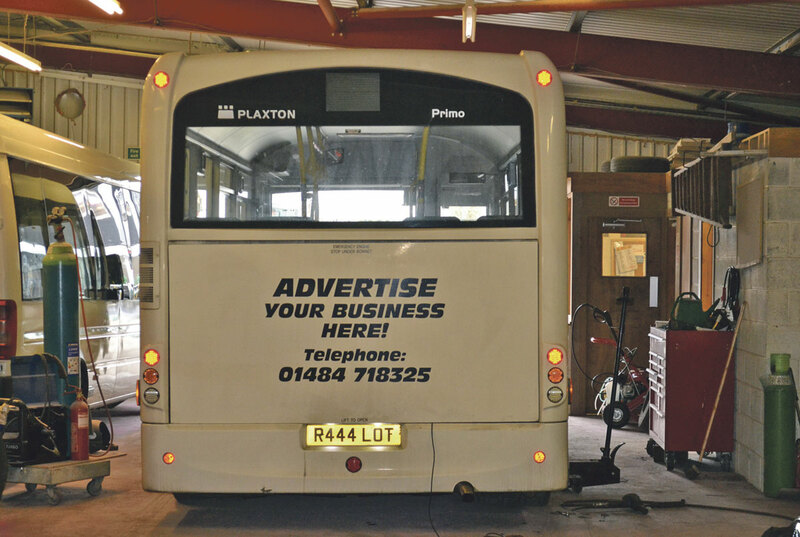 Jeanette doesn’t drive anymore and actually admits to disliking it but she is very fond of the Plaxton Primos that she operates, referring to them as ‘my girls.’ They are a bit of a Marmite vehicle but Jeanette loves them and has had very few problems with them. She says, ’They are perfect for us, the right size and nippy’. 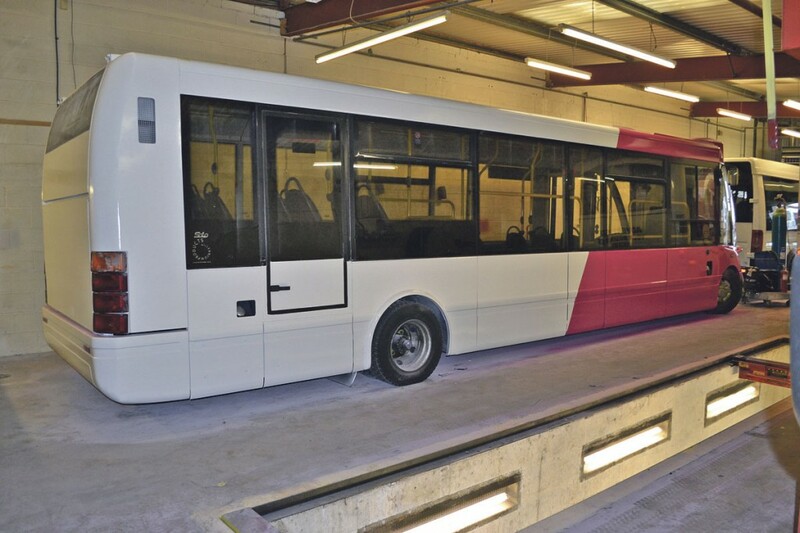 Half of the fleet, which is a mixture of Primos, Optare Solos and VW minibuses, is owned and the rest are financed by Close Brothers. All of the vehicles are currently being fitted with CCTV and forward and rear facing cameras by Intelligent Telematics. 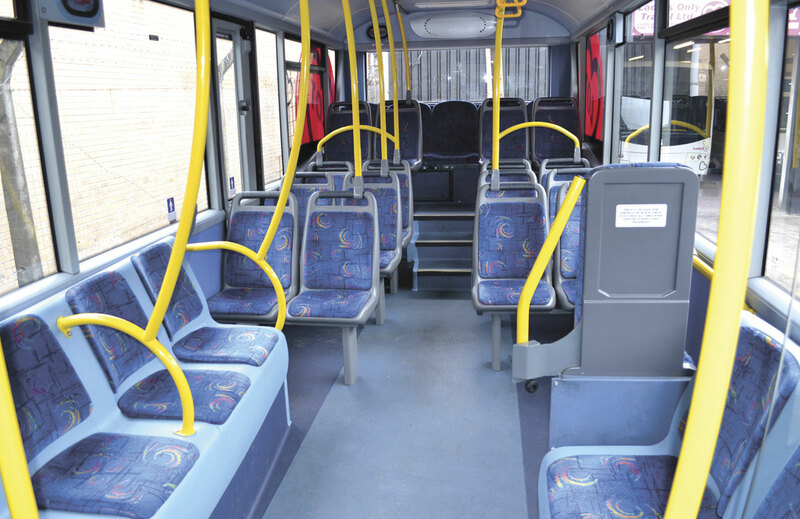 Jeanette explained that unfortunately a few unscrupulous people will look for cameras before boarding a bus and have made false claims against her drivers, although often, witnesses have come forward against the claimant. It would have been very easy for someone in Jeanette’s situation to become very bitter, but instead, with quiet determination, guts and a positive attitude, she has challenged and conquered those who doubted she could succeed. It’s been a tough, sometimes lonely journey, with some hard lessons learned along the way, but she has stuck to what she believes in and is now the proud owner of a successful business. She has a strong, loyal team behind her and the will to continue to thrive. Jeanette is not just a success story because she is a woman in a man’s world or because she is a victim of an injustice, she is a success because of her tenacity.